IPl 2019 Free Broadcast Channels, RCB Vs DC IPL 2019 Live Streaming: Watch Match In HD Quality on Hotstar, Airtel TV, Reliance Jio TV For Free. Indian Premier League 2019 (IPL 2019) is becoming more intresting as the day passes and now the first phase of round-robin matches about to complete. Almost all the teams have already played five matches. 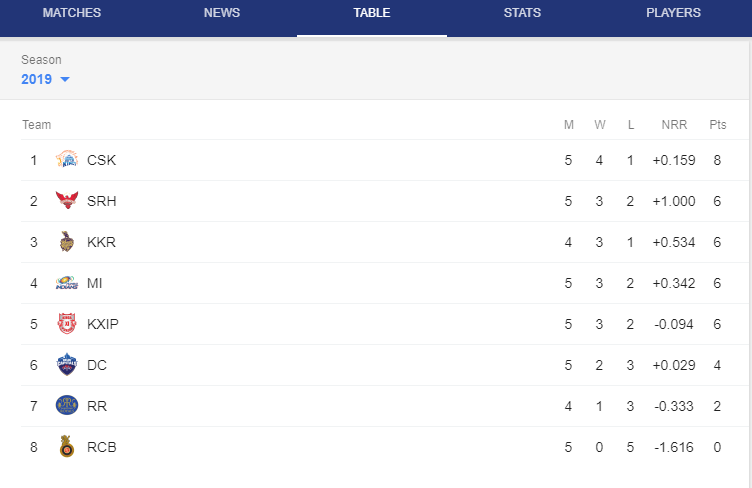 Meanwhile, Royal Challengers Bangalore (RCB) has not yet won a single match. Talking about today’s cricket match in IPL 2019, there are two matches to be played on April 7, one between Royal Challengers Bangalore vs Delhi Capitals and other between Rajasthan Royals vs Kolkata Knight Riders. Before getting more details about live streaming, Start time, venue, updated time table and live score of today’s match, let’s take a look at Yesterday’s highlights. On April 6, we have seen two intresting matches, in the first match which was played between Chennai Super Kings vs Kings XI Punjab. CSK had given KXIP a target of 161 runs to win but they could only manage to score 138 runs in 20 overs. Mahendra Singh Dhoni’s player performed outstanding and got back to winning ways and topped the Point Table again. In CSK vs KXIP match, Chennai Super Kings won by 22 runs. Royal Challengers Bangalore and Delhi Capitals to take on in the IPL 2019 match 20. This match will be played at RCB’s home venue- M.Chinnaswamy Stadium in Bengaluru. The RCB vs DC is likely to start at 04:00 p.m (IST). The cricket lovers can watch the IPL match free on TV (broadcast) Channels and via online streaming on mobile apps. As we have earlier told you that Star Sports holds the telecast rights of IPL 2019 and will broadcast the match live across its network.